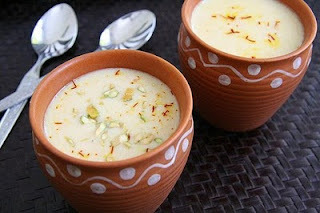 Prathu's Food: Basundi - Passionate Cooking for Vegeterian Food. 1. 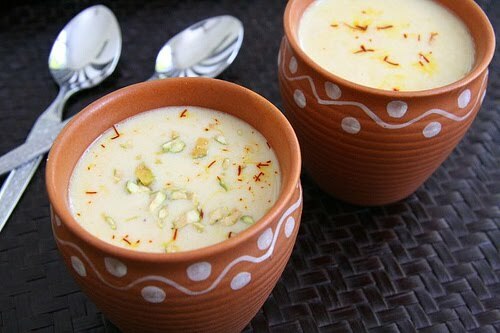 In a broad and heavy bottomed pan, add milk and heat in a high flame till milk starts boiling. 2. Reduce flame and cook, keeping a ladle in the centre. 3. When cream is formed on top, gently keep pushing it to the sides of the vessel. 4. Cook till 3/4th of the milk is reduced, repeating the process. 5. When little milk is left, scrape corners and put all the cream in the milk. 6. Add sugar and switch off the stove. 7. Stir gently, till sugar is dissolved completely. 8. Fry sliced nuts in ghee and mix with basandhi.